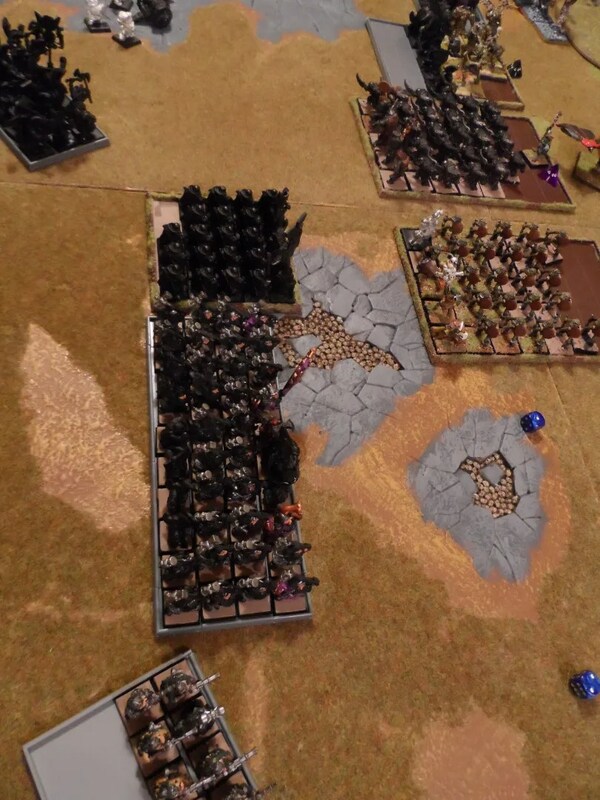 Two units of Dwarf Rangers then deployed – one was 40 strong ! 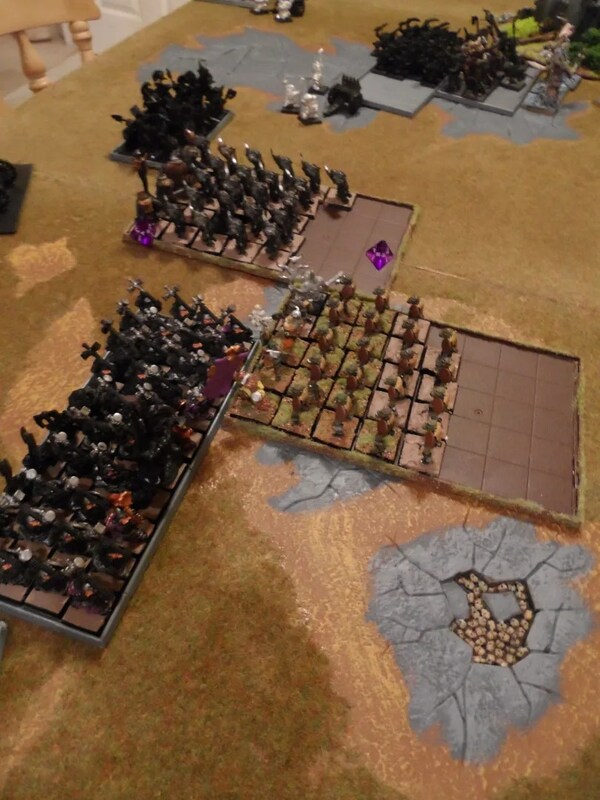 The Savage Orcs and Wolf Riders, facing 40 XB armed Dwarf Rangers charge into combat, but bounce off leaving just the Orc Hero to slow down this flank. This leaves 2 Bolt Throwers and 20 arrer boyz in defence. This flank held much longer than expected despite a gyrocopter swooping in. 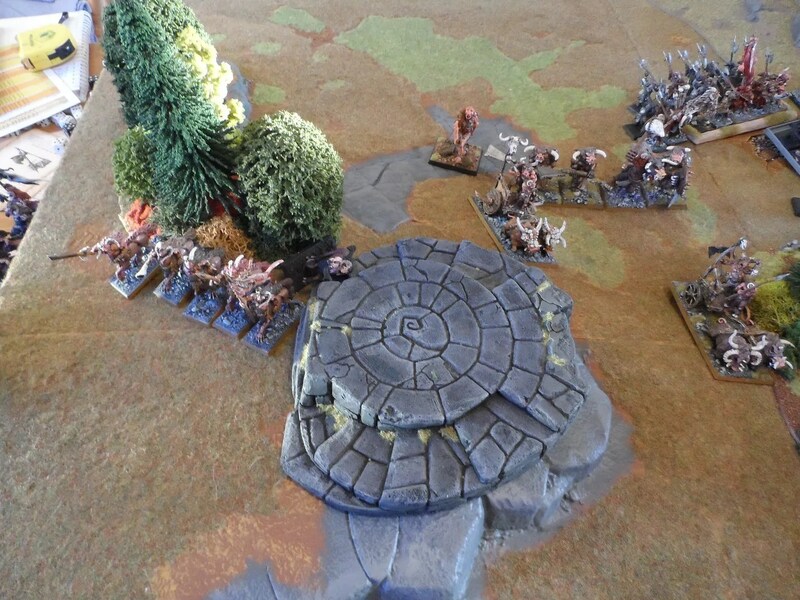 The Beastmen’s main units get cobbled up and congested behind the scenery. This has a major effect on the rest of the game. 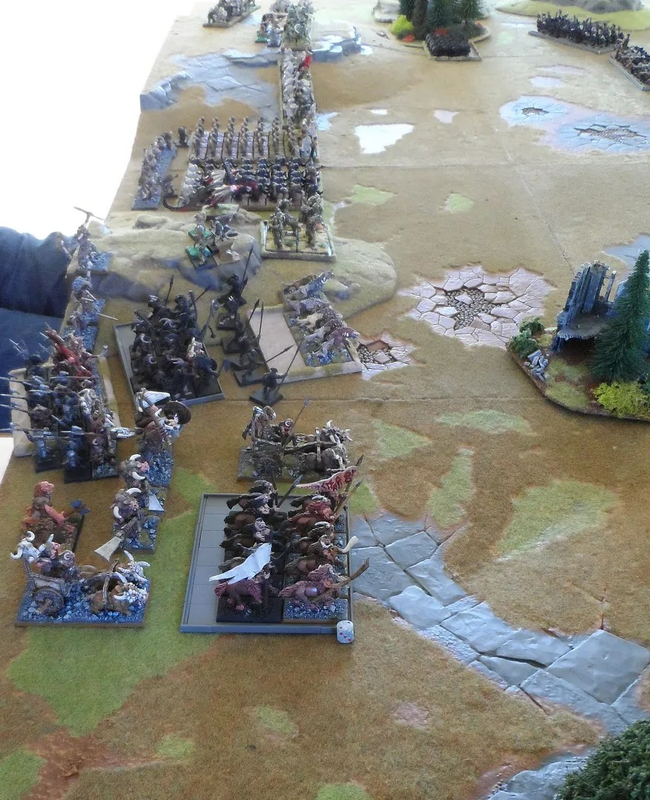 Beastmen ambush the DWarves, to no avail and are quickly driven off. 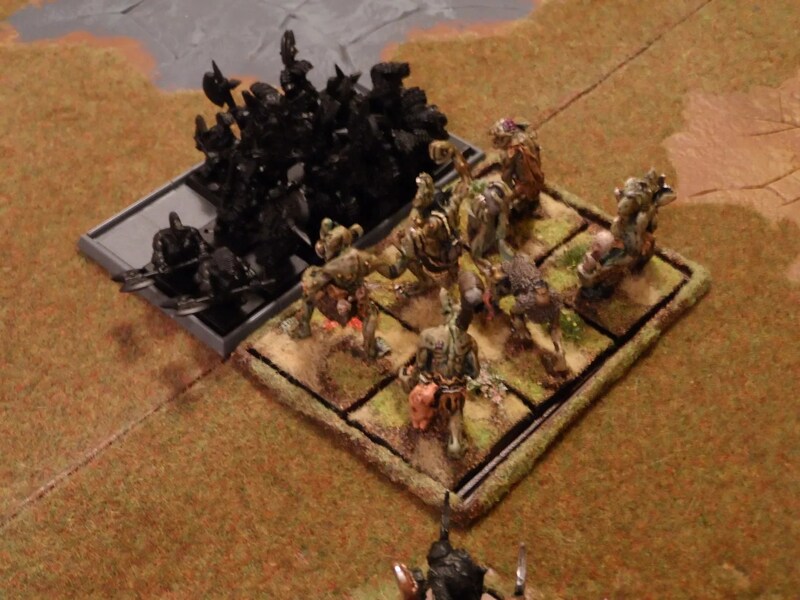 The Chaos Ogres adided by the Orc General on Wyvern charge into a Dwarven horde. 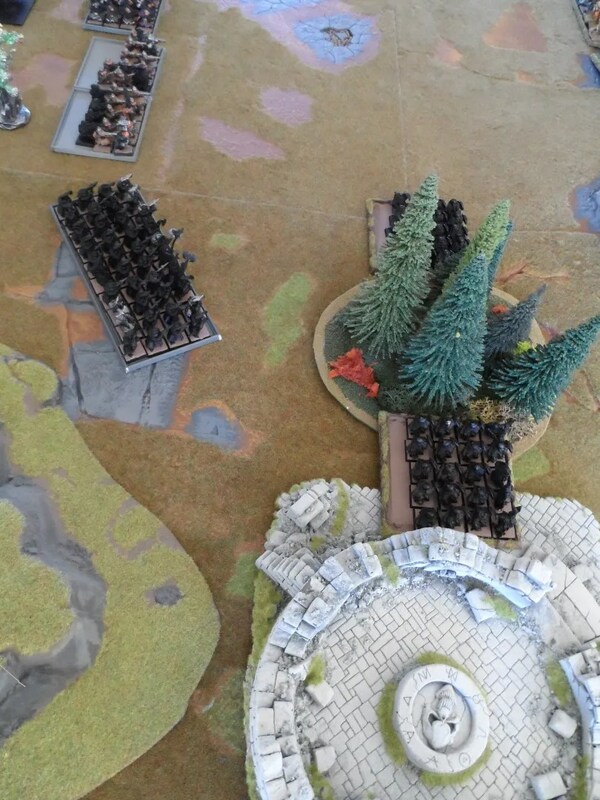 The Gyropcopters on the flank mess things up. Head to head in the centre of the table. 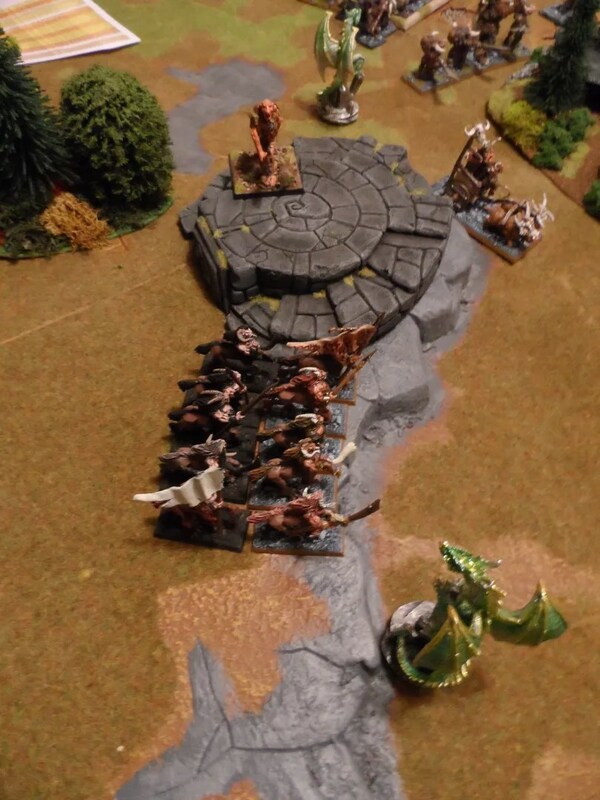 Trolls vs Trolls Slayers – at long last. Centigors get stuck in to a Gyrocopter. 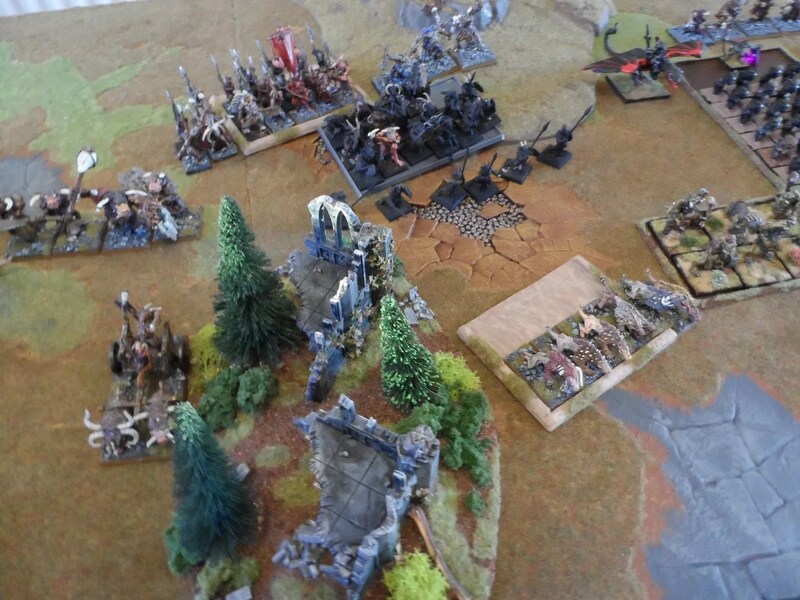 The centre of the board veers back and forth ! The day arrives, our long planned two day Xmashammer extravaganza. 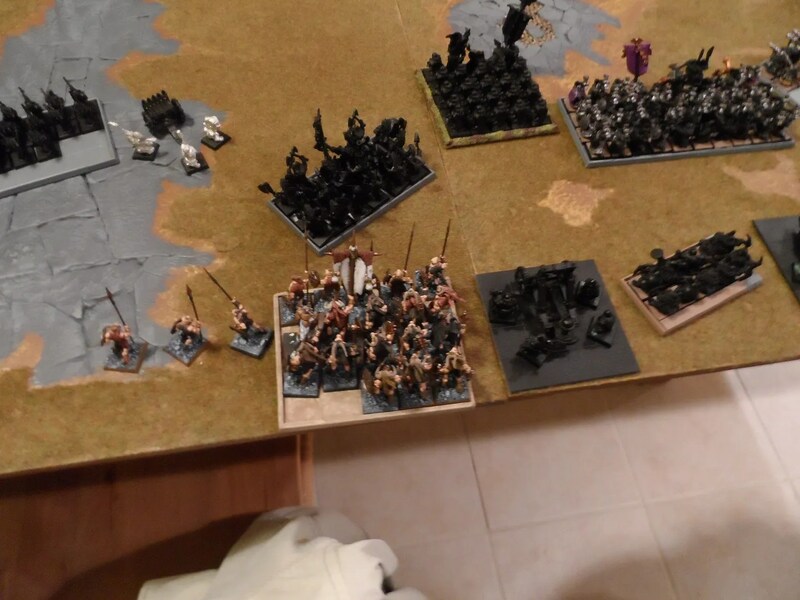 4 players plus myself, each player fielding 5,000 PV armies so people get to bring out lots of toys ! My cleaner had popped round the day before yesterday so everything was spick and span. I’d fixed the toilet even (the builders broke it). 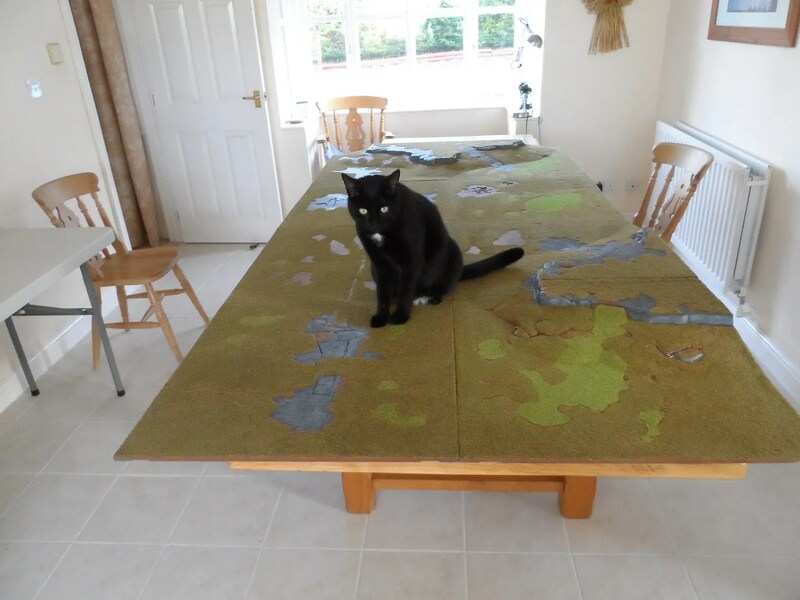 I’d set the board up, a mighty 8×4′. It even passed feline approval from BlackJack. 10.30, a clearly unwell Rich phones up and says he is unwell and cannot attend. Clang, that’s a spanner in the works. Clang, two spanners in the works, because he was going to supply Roo with some figures for the Beastman army. 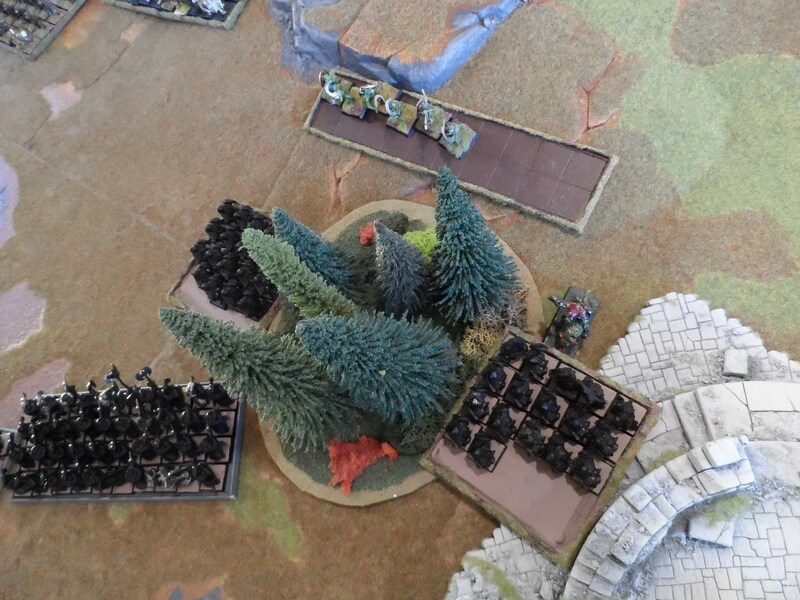 Anthony arrives, is briefed with the news we’re going to have to make it up on the spot, and he points out he has come with an efficiently packed army and has little leeway for expanding his army. 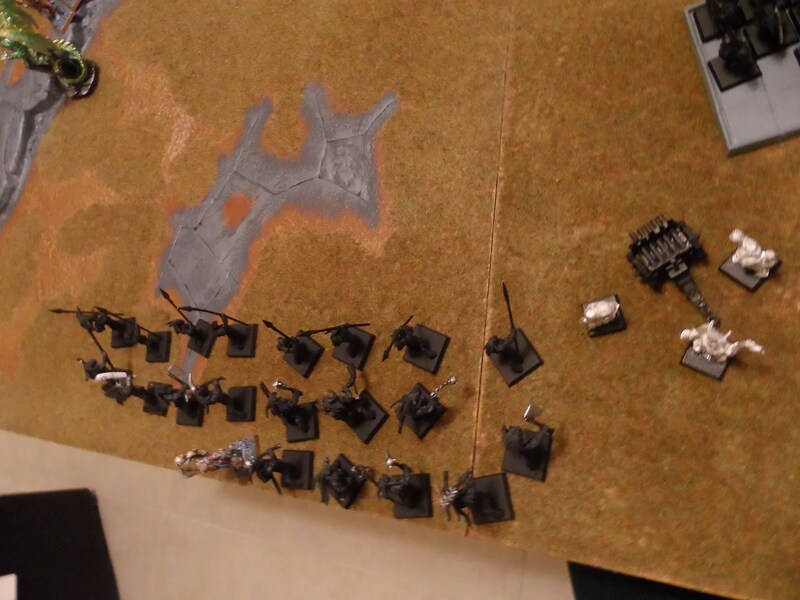 Luckily, I have some stunties and go find them, so at least that wasn’t another spanner in the works. 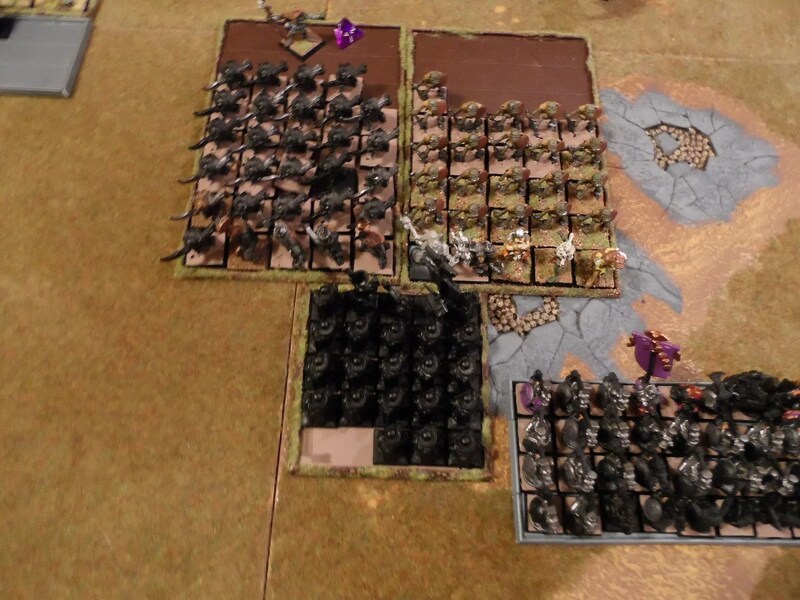 Gav phones up, and e-mails me his army spreadsheet. Clang, another spanner in the works, the spreadsheet obviously wasn’t saved properly so when he arrives we have to start almost from scratch. 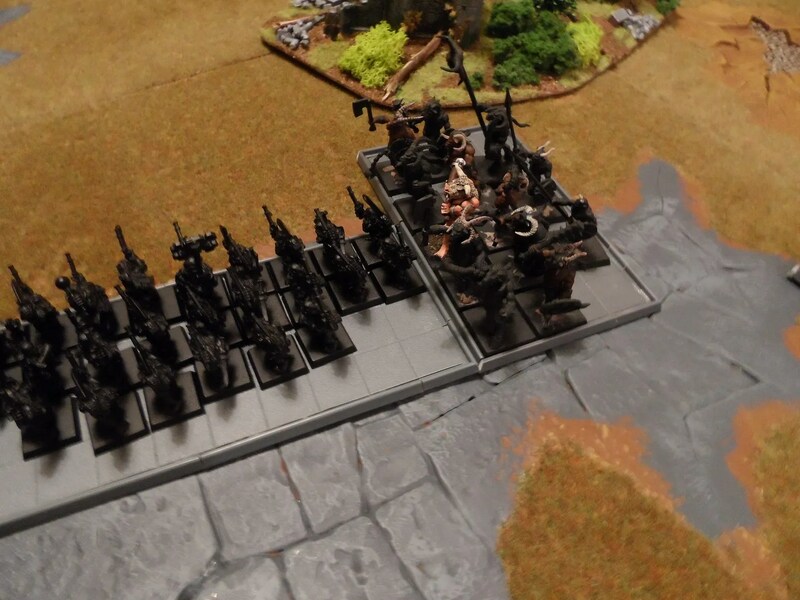 Interestingly, von Moltke was also a wargamer. 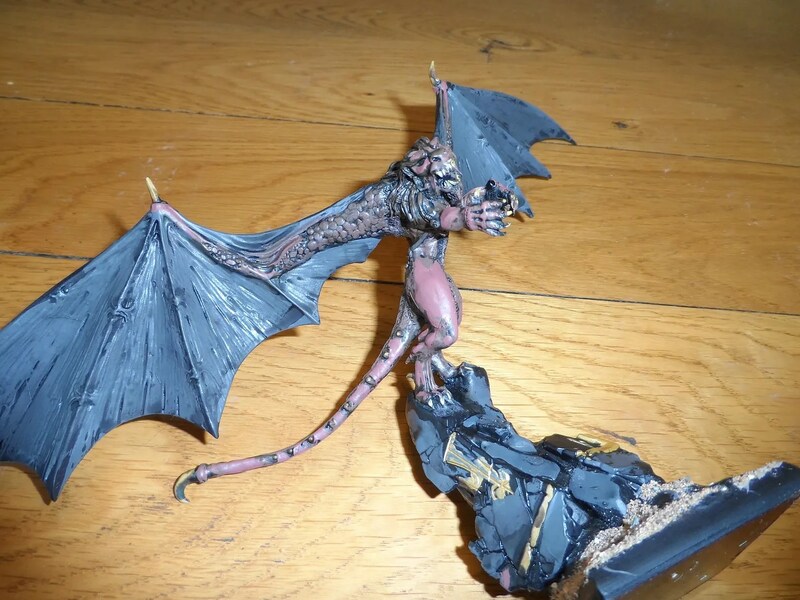 Great Wing, my heavily modified Manticore. Now with some mid and highlights. 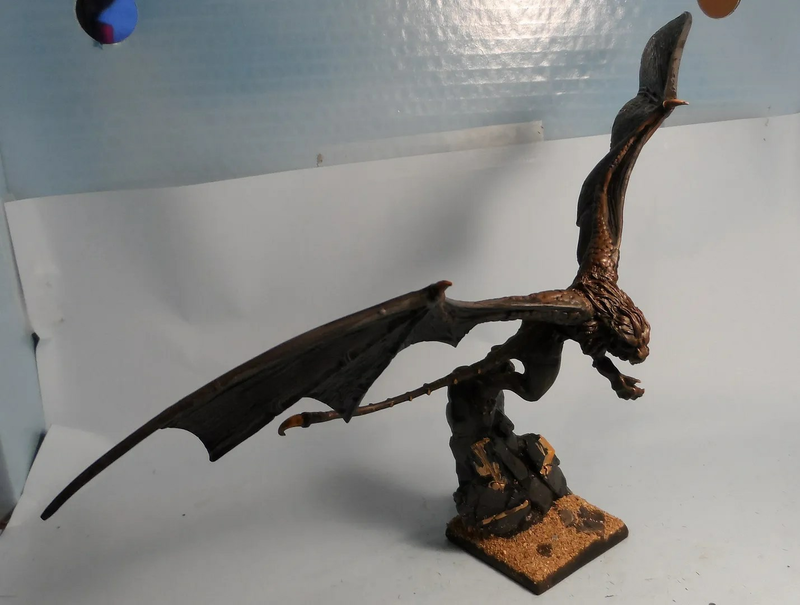 Silver Talons & Great Wing’s rider (aka Redark the Hunter). 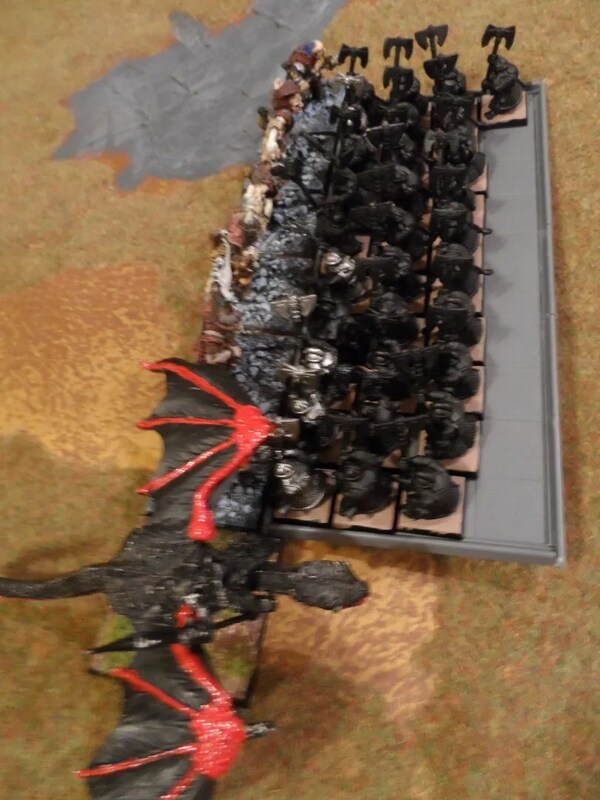 The Silver Talons are to be the back rank of the existing unit. The rider has four arms with magnets so I can mix and match the equipment between sword, lance (right arm), and shield or RXB (left arm). 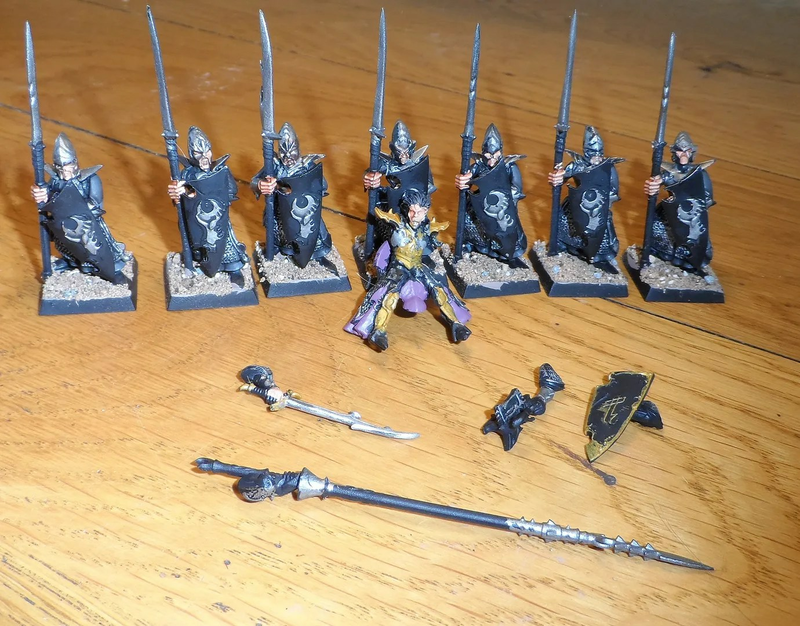 Finished off the first two tranches of Dark Elves. I was somewhat delayed as I was helping oversee my parents’ transition to an iMac, from their wheezing grindingly slow PC today. The sales engineer and I did enjoy finding all their archaic hardware and trying to make it work with the new h/ware from this side of the renaissance. 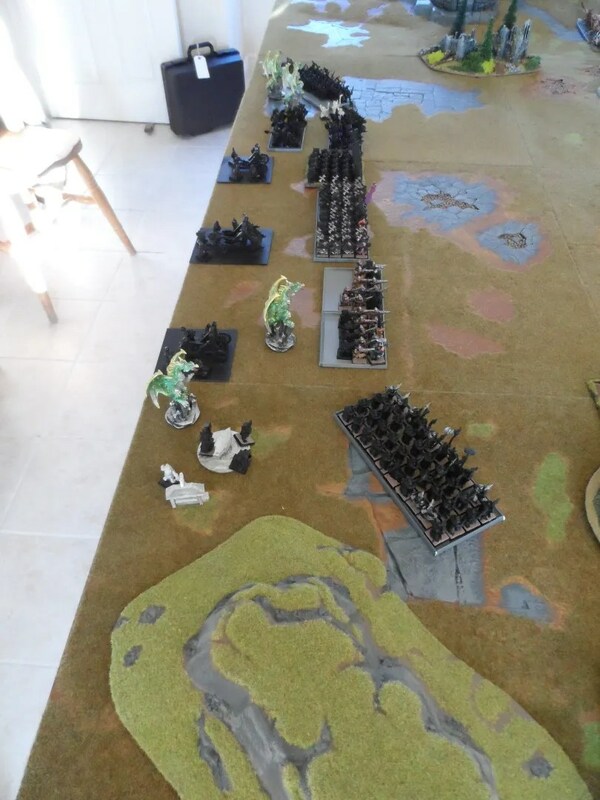 In the latest edition of WHFB, larger units are the order of the day, so having bought some plastic kits about6-8 months ago finished them off. 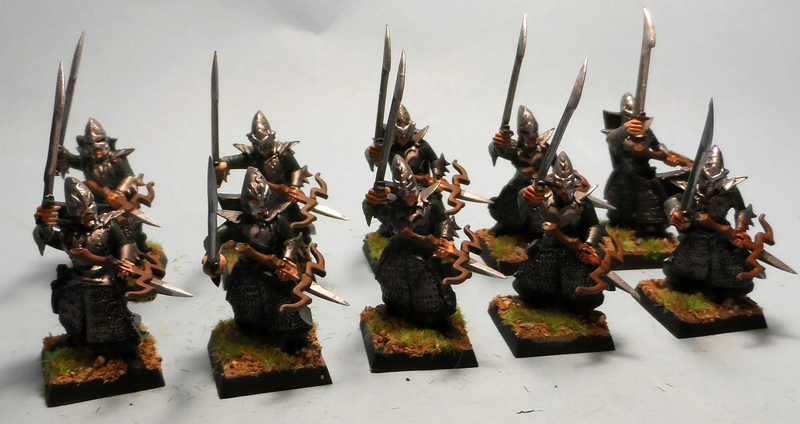 An all female unit of spearmen. Gold shoulder pads and breast plates distinguish them from the other 40 spearmen. 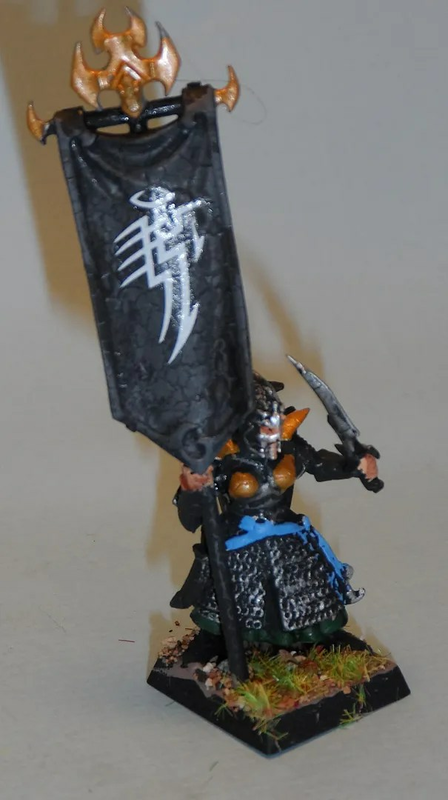 I then created a new standard bearer for them, using the new standard and transfer. 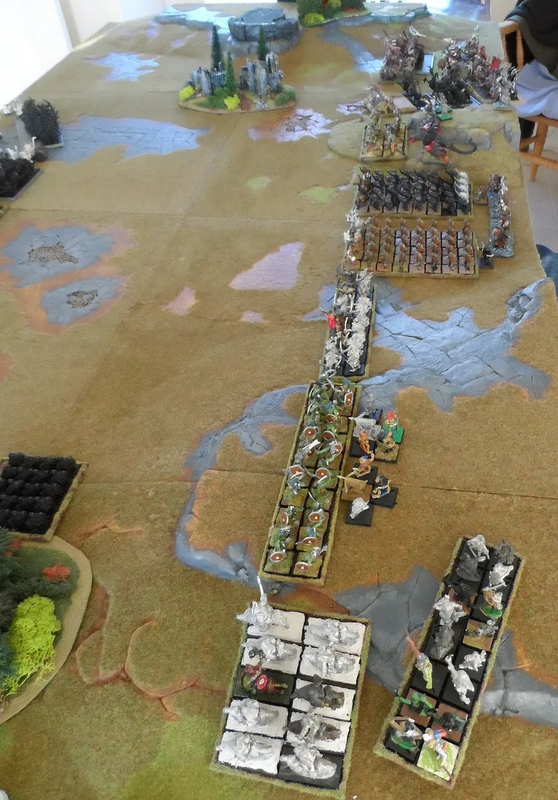 the painting is to wargaming standard, as most of these figures are destined for the back ranks of units, thus being hidden and removed as casualties first. So basic coat of paint, wash and simple highlights only. Just as well I have other things WIP, such as great wing. 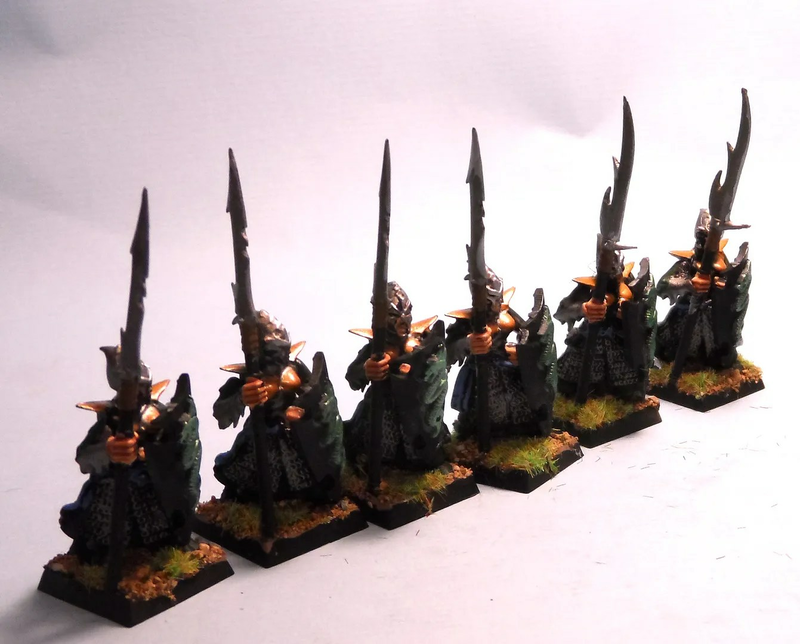 Lighting is not good, but all the base colour paint, and wash is now done. 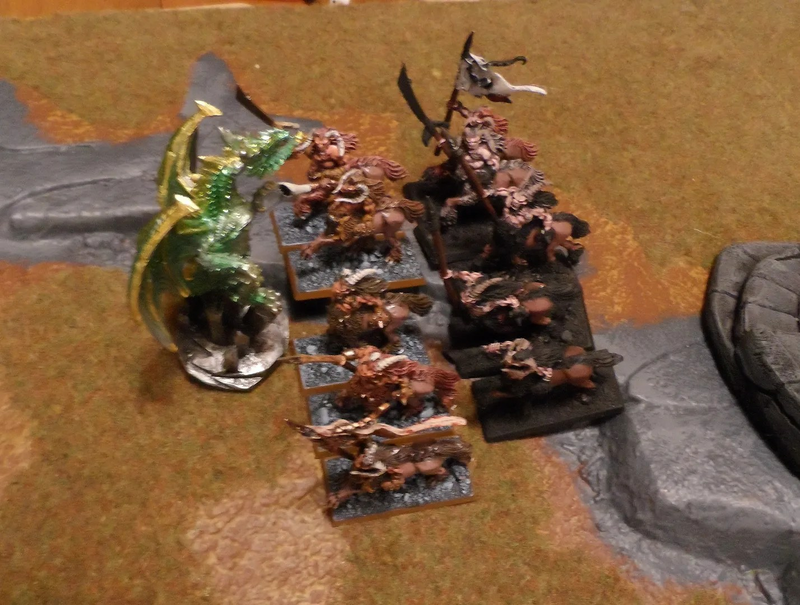 I hope to both Greatwing and his rider ready for Xmashammer (28/29th), in which I as the host may get to play. But do you recall the most loathesome beastie of all? And if you ever saw it, you would scream and go insane. Laughed at him and made remarks. They never let poor Freddy whisper to them in the dark. As they buzzed about the place. Right, I have been busy hence a paucity of updates here. Firstly, the builders have been in and out again. The tiled floor they laid is cracking up, so I have a parade of builders, tilers, and suppliers in and out of the house trying to work out what is wrong and shift the blame. Basically its a crunchy floor I have as the tiles shift round. Seems like the adhesive is to blame. Now, this is important as in the run up to Xmashammer we have to have a theme, so crunchy floors have turned into crunchy frogs. Just nod, and phone the doctors…. Luckily for the Byakhees, I have promised not to cook a crunchy frog pizza. Secondly, Peter O’Toole never produced Lark’s vomit, but he was very good in films like Lawrence of Arabia. So that got watched as homage to a great actor who passed away this week. Plus it has Rolls Royce cars and all manner of WW1 shenanigans. It also helped pass the time whilst ironing. 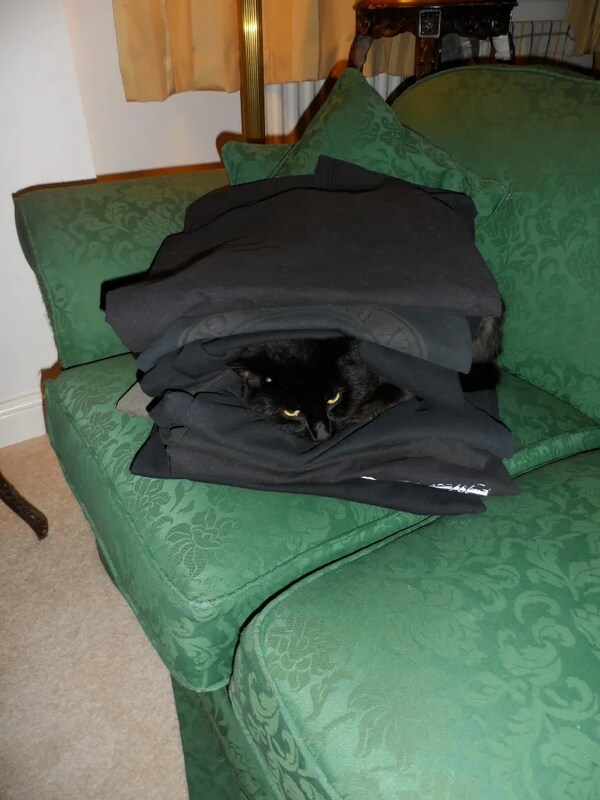 This is Spades, who insisted on siting on the ironing pile but got more than he bargained for. 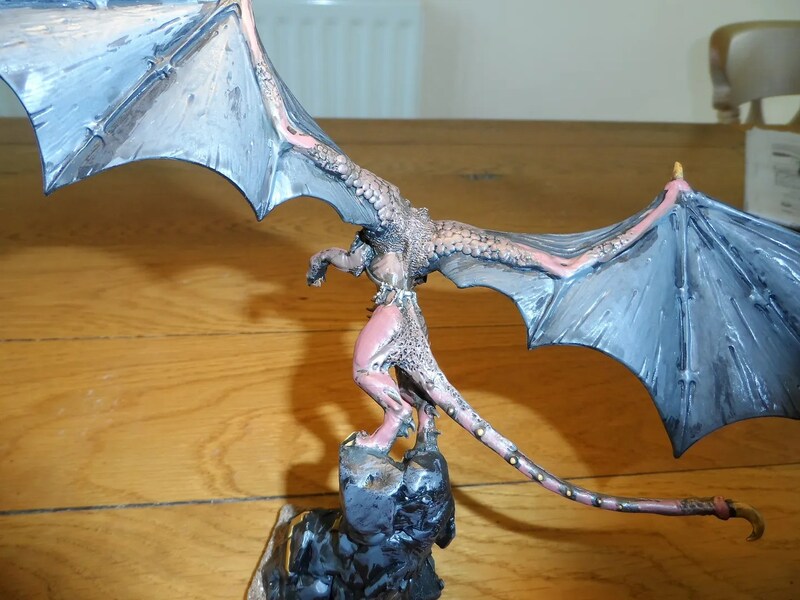 Thirdly: In the meantime I have virtually finished off the Sister of Spears including new standard, the extra Silver Talons, and have got Great Wing along with Dark Riders well advanced so I still hope to achieve the end of the year aim. Xmashammer 2014 is now planned, so I should have lots of photos before the end of the year.